Stair Climb Training Update | Keep It Up, David! I’m back on schedule! I didn’t publish yesterday’s post until about noon, so all of you that checked for a new post earlier in the morning and didn’t find one, my bad. Click here to read it – it has a great watermelon gazpacho recipe! Over the weekend, I realized that a week had passed without me doing any StairMaster workouts. I had done other workouts, and plenty of them, but I’m in training right now for two separate stair climbing challenges, and the StairMaster was my primary training method. On Sunday, I headed off to the gym, but hit an unexpected snag: the Los Angeles Marathon. The marathon closed roads across the city, and I didn’t learn until I was a few blocks away from my gym that the road closures were gonna prevent me from getting to the gym altogether. I’m sure, had I looked it up, I would’ve found where I could’ve crossed the route, but I didn’t take time the time, because I was on a schedule. I had other errands to run and things to do, and when I was forced to detour, I decided that I would screw the gym, knock some other things off my to-do list, and hope I would have time later in the day to exercise in the little gym in my building. Can you guess what happened? Yep, I never worked out. One thing led to another, and Sunday ended up being an unplanned rest day. I was a little annoyed, because I had taken a well-earned, planned rest day on Thursday, just three days prior, but two rest days in one week isn’t the end of the world. Didja see that last record? ONE HUNDRED AND THIRTY ONE FLOORS! That’s 22 stories more than my previous best! It made me feel more confident about my upcoming 163-story StairMaster challenge/fundraiser (donate here), and it also wiped me out. It was completely exhausting. But I wasn’t finished quite yet – after wiping down the machine, catching my breath, and moseying around for a few minutes, I headed up to the weight room and lifted weights for 30 minutes. Whew! 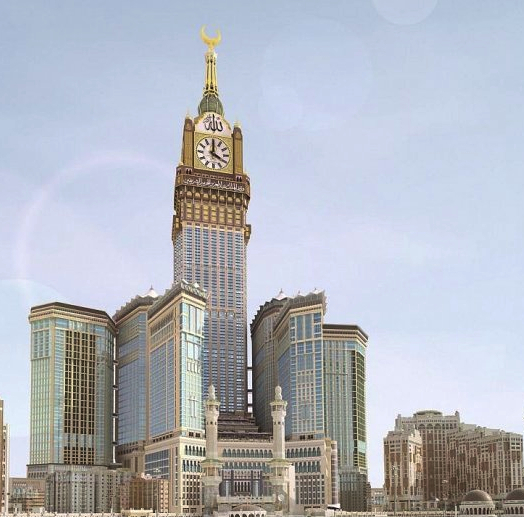 Although it’s not the world’s tallest building, the Abraj Al Bait (which opens this year) still holds a number of impressive records. It’s the world’s tallest hotel, and has the largest floor space of any building in the world. When I look at the above photo, I see a building that looks a lot shorter than 120 stories, and I think it’s because the clock tower throws off my sense of scale. Then I read about how ginormous that clock tower is, and it started to make sense. There’s a clock on all four sides of the tower, and they’re the biggest clocks in the world. Each clock’s diameter is 141 feet (almost half a football field, or about 14 stories stories high!). By comparison, Big Ben’s clock faces are a puny 23 feet across. 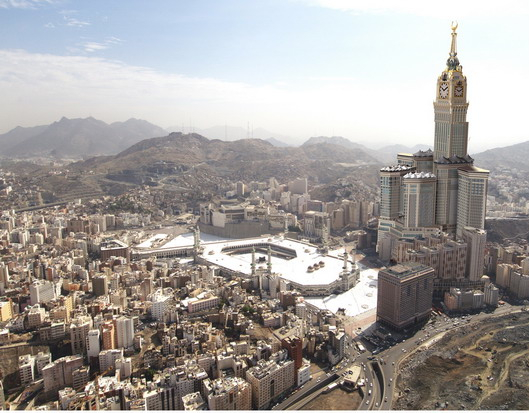 I got a much better sense of scale from this picture, which shows the Abraj Al Bait in comparison to the rest of Mecca’s skyline. Yep! That’s one tall building! And I climbed it! This entry was posted on Wednesday, March 21st, 2012 at 12:26 am and is filed under Uncategorized. You can follow any responses to this entry through the RSS 2.0 feed. You can leave a response, or trackback from your own site. Great Job! Stair Climbing is one of the best cardio workouts you can do because it activates the largest muscle systems in your body, which burn the most calories. Therefore you get results!